Can this 15" media centre be a winner without a Blu-ray drive? 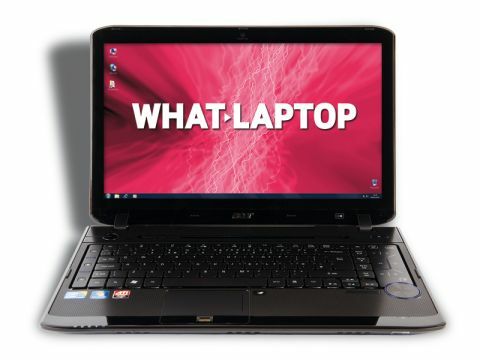 Acer is always among the first to embrace the latest technology and offer it to consumers at competitive prices. This is proved here by the Acer Aspire 5940G-724G50Mn, a stunningly powered, quad-core machine and a great home media centre. As with all machines in this group test, Intel's cutting-edge Core i7 720QM processor provides staggering performance. While clocked at just 1.6GHz, this quad-core chip can overclock itself dramatically to as much as 2.8GHz for truly market-leading levels of power. This is by far one of the fastest machines you can buy. Even when multi-tasking market-leading office suites and photo editing applications it flies along, making it ideal for even the most demanding use. This level of power is continued on the graphics side. While the GPU is not the fastest chip in ATI's range, it effortlessly handles the latest games and makes light work of photo and video editing tasks. It is also HD-compatible, allowing high-definition video to run with ease. However, this is one of the few laptops in its price range not to feature a Blu-ray drive. Standard DVDs can be played, but it's a real thorn in the side of this machine. While the 15.6-inch screen is the smallest in this group, it provides striking images. It is not as bright as we'd have liked and lacks Full HD support, but its effective colour and contrast and WXGA resolution show photos and movies to great effect. One small complaint is the screen's limited movement. As it only folds back a few degrees past vertical, it can be awkward to achieve a comfortable viewing angle. This is the only criticism, as the rest of the chassis is superbly designed. The keyboard is great, with all keys raised above the chassis and ample spacing between them. The flat keys may deter some users, but we found it comfortable to use. A multimedia control panel is also fitted for easy control of your media files. Inevitably for such a high-powered machine, mobility is somewhat limited. While this is quite a small and light machine, but it also has low battery life at 164 minutes. This falls to just 90 minutes when watching a DVD, so bear this in mind before buying. Continuing Acer's reputation for high-quality machines, the Aspire 5940G-724G50Mn is a great laptop. While it lacks a Blu-ray drive or the big screen and Full HD resolution you can get on other machines, we still found plenty to like.